PEN® eNews is a bimonthly e-newsletter shared with the global PEN Community and created to help dietitians position themselves as leaders in evidence-based nutrition practice. In addition, users of the PEN System will find articles on the new evidence, resources and features available and how to maximize one's use of PEN. Do you remember when "The Biggest Loser" made its TV debut, turning weight loss into a reality show? When the FDA banned the sale of diet drugs and supplements containing ephedra after it was linked to heart attacks? The year was 2004. It was the same year that, after years of environmental scanning and research into finding out how to best help support dietetic practice, the concept of Practice-based Evidence in Nutrition® (PEN®) was unveiled at the International Congress of Dietetics in Chicago. 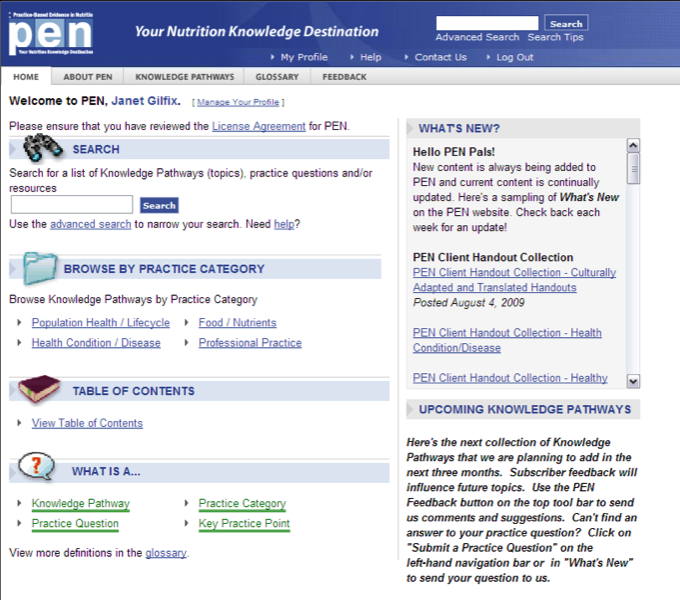 Then, with 12 knowledge pathways, and our first dietitian contact center licensee, PEN® was launched in 2005! Fast forward 10 years to 2015, we have grown to become an internationally-used knowledge database to support dietetic practice, with 190 knowledge pathways! “Recognizing that staying on top of nutrition knowledge is a big job and that we are a relatively small profession, we quickly realized the need to reach out to other dietetic associations to create a global nutrition resource that would enable dietitians around the world to collaboratively synthesize evidence, share their resources and advance dietetic practice within their own countries and globally. We are so proud of this collaboration.” Dr Jayne Thirsk, Director, PEN®. Over this past year, we have been counting down to this milestone and in this Anniversary issue of PEN® eNews, we celebrate! We invited dietitians to contribute to a story, asking their opinion of what is the most significant change in nutrition knowledge and dietetic practice that has occurred over the last 10 years. A total of 30 submissions were received from around the world, showcasing the breadth of dietetic practice. I found it fascinating to read these submissions, which ranged from vegetarian diets, sports nutrition, the low FODMAP diet to changes in how we manage gout, how we prevent and treat food allergies, to chronic disease management, and of course, the many ways the culture in which we practice has evolved. Click here to read this story. As part of looking back, we highlight what PEN® looked like 10 years ago compared to today in Technological Advances in PEN® over the last 10 years. We also note trends in nutrition articles published in Publishing Trends over 10 Years. We highlight a new feature in PEN®: adding in customized notes to PEN® client handouts. We also give a preview of what is in our future in A Face-lift for the PEN® Client Handout Template: Highlights from a Recent Survey and Investigating a PEN® App. Finally, our director, Dr Jayne Thirsk shares her thoughts on the challenges for dietitians and evidence-based practice and highlights future opportunities for dietitians in PEN@10 Years: Past, Present Challenges and Future Opportunities for Dietitians. This and more in PEN® eNews 5(2) and 5(S), celebrating PEN@10 years. We look forward to charting the course of nutrition and dietetics over the next decade with you! PEN® eNews may contain links to other external websites. PENnutrition.com is not responsible for the privacy practices or the content of such external websites. 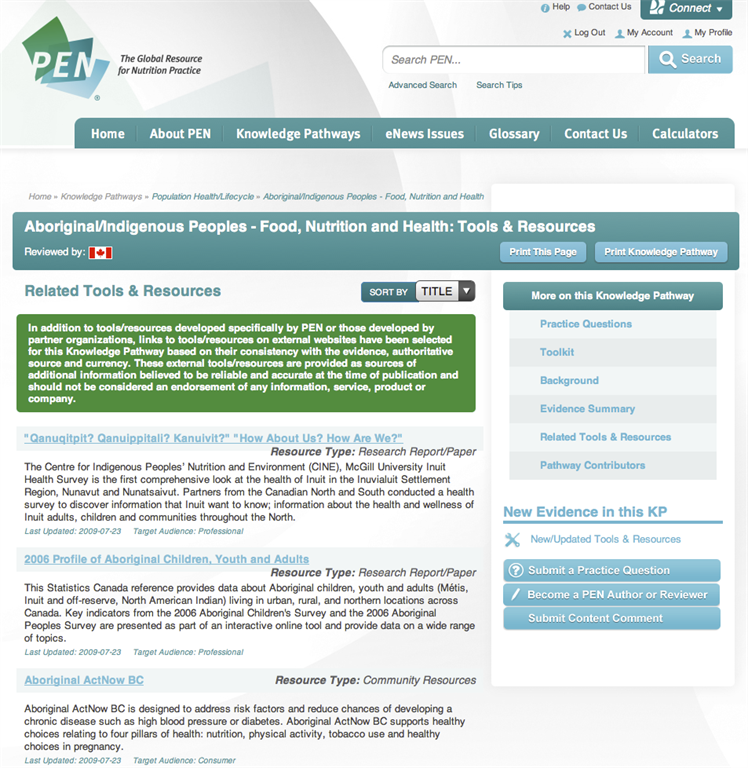 Neither Dietitians of Canada, nor any dietetic associations contributing to or licensing the content in Practice-based Evidence in Nutrition: PEN® endorse the content, products or services on other websites. Wondering what is new in the PEN® database? Here is a list of our updated content including updated knowledge pathways, new practice questions, updated practice questions, new professional tools, updated professional tools, and new handouts. What are the short- and long-term physical and mental health effects of high added sugar consumption in children and adolescents (≤18 years old)? What interventions can help reduce consumption of energy from sugar-sweetened beverages (SSBs) in children? What changes in breastfeeding have been shown to be effective in treating infants with gastroesophageal reflux (GER)/gastroesophageal reflux disease (GERD)? How effective are interventions using a stage-based approach in bringing about positive change in dietary behaviour? What infant feeding formulas contribute to risk reduction for allergic diseases, including food allergy and eczema, among infants at high risk for allergy? Do children who are hyperactive or children with attention deficit hyperactivity disorder (ADHD) who consume diets low in sugar, compared to children who consume diets high in sugar, experience less behavioural problems? Can infants who present with gastroesophageal reflux (GER/GOR)/gastroesophageal reflux disease (GERD/GORD) have an underlying cow’s milk protein allergy (CMPA)? Is cow’s milk protein allergy a common cause of chronic functional constipation in children (0 to 18 years)? What other dietary factors are associated with or increase the risk of ECC? Are higher body weights recommended to reduce the risk of mortality and improve patient outcomes in individuals undergoing dialysis? Has the use of the Transtheoretical Model/Stages of Change to assess an individual’s readiness to make dietary behaviour change been validated? Is permissive underfeeding (hypocaloric feeding) or an initial strategy of trophic (low dose) feeding associated with improved outcomes in critically ill adults compared to feeding according to calculated energy requirements? What strategies are effective to optimize delivery of enteral nutrition and minimize risks in critically ill patients (e.g. feeding protocols, motility agents, positioning)? Is the practice of measuring gastric residual volume (GRV) in mechanically ventilated critically ill patients who are tube fed into the stomach reliable for predicting tolerance, regurgitation and aspiration? What is considered an acceptable GRV? What are the recommendations for the prevention of cardiovascular disease (CVD) among adult renal transplant recipients (RTRs)? What are the recommended protein intakes for adult renal transplant recipients (RTRs)? Should adult renal transplant recipients (RTRs) with anemia supplement with vitamin C? What are the effects of immunosuppressive drugs on serum magnesium levels in renal transplant recipients (RTRs)? What is the vitamin D status of renal transplant recipients (RTRs)? Is vitamin D supplementation recommended for RTRs? Is alcohol consumption contraindicated for renal transplant recipients (RTRs)? Is the consumption of rice (white and brown) associated with increased arsenic-related health risks? How effective are interventions using cognitive behavioural therapy for achieving reductions in energy intake leading to weight loss? How do I add in customized notes to PEN® client handouts? Are you using PEN® client handouts, but want to add in customized notes for your clients? PEN® has added this new feature! Now, when you share or print a handout, you can add up to six lines of text individualized for your client. We have often heard from dietitians that they would like to add client goals or highlight key recommendations in the Notes section, and now you can! The section heading makes it clear that it is, ‘Additional Notes From Your Health Care Professional’ and the part you add is provided in italics to help distinguish it further. You can add your personalized notes by clicking on the Customize and Share this Resource button. See detailed instructions below. Please note: While our IT team is working on resolving this, this option is currently only available to PEN® users who have an individual or group subscription. Site license users can email a handout to clients using the “Customize and Share this Resource” but they can only customize the email message, and cannot add a specific logo. 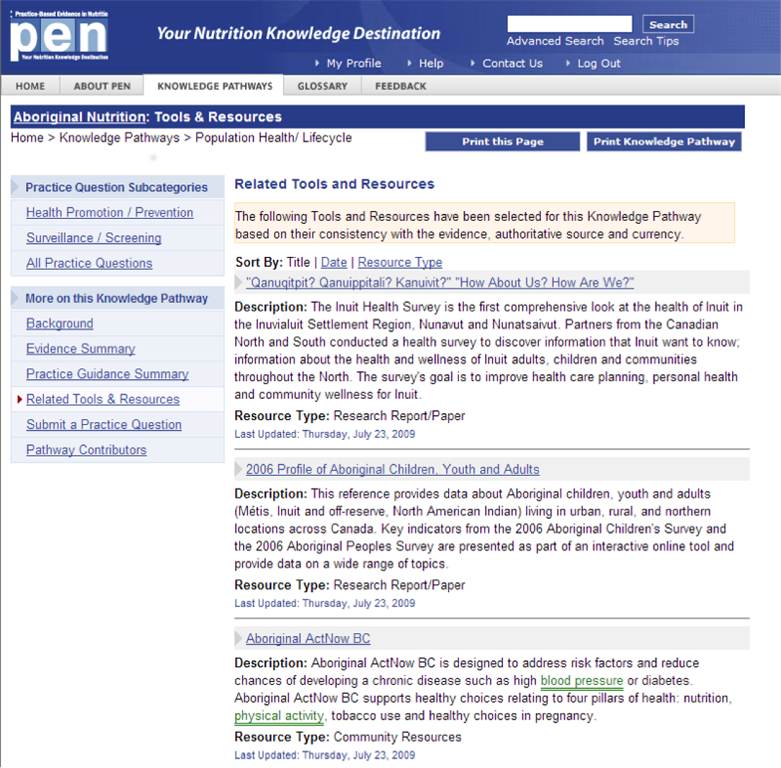 After you access a PEN® handout from the general search, or choosing Related Tools and Resources within a knowledge pathway, or from the PEN® client handout collection accessed from the Home page, follow the steps below. 1. Click on the button labeled “Customize and Share this Resource” underneath the list of Knowledge Pathways were this tool or resource is found. 2. A pop-up window will appear that will allow you to enter your email address, your client’s email address, a personal message for the email, and a message in the Notes section (up to six lines of text) and information on who the handout is distributed by. 3. Once you have entered the information, you can click ‘PDF Preview’ to check that information is correct, and then you can click send. If you want to provide a hard copy to your client, you just need to email the handout to yourself, and then print. Jane Bellman or Kerri Staden. Looking back over the past 10 years as Editor of the Canadian Journal of Dietetic Practice & Research (the Journal), I am struck by the wide variety of topics covered by the almost 350 articles published quarterly in the Journal since 2005. 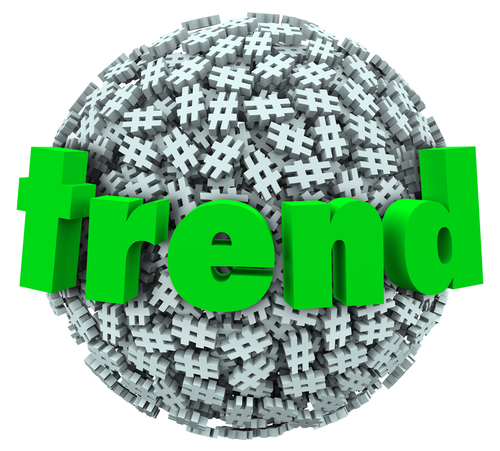 How do we really look at trends? Searching PubMed for ‘trends’ in the Journal* (Table 1) reveals an interesting array of papers covering nutrition assessment and counselling to food and cooking skills, population intake of processed foods and environmental food services. For example, we now take dietitians in primary health care for granted, but 10 years ago, we were building this vision and the Journal supported an entire ‘Supplement on Primary Health Care’. This publication helped to shape this important area for dietitians by providing thought leadership and offering opportunities to develop a community of practice. Other examples include the publication of an article on web-based care for nutrition management. The use of technology has exploded over the last 10 years and the Journal has offered practice-based research to support dietitians in this area. 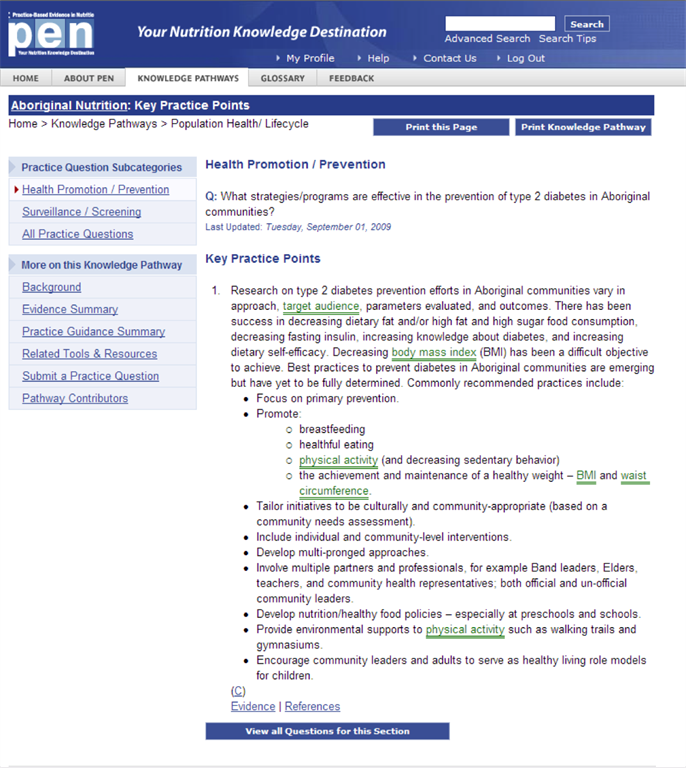 2006 Building a vision of dietitian services in primary health care. B Cantwell, C Clark, J Bellman. 2007 Food preferences and meal satisfaction of meals on wheels recipients. 2008 Web-based care for adults with type 2 diabetes. 2009 Dietary intakes, attitudes toward carbohydrates of postmenopausal women following low carbohydrate diets. 2010 Food, cooking skills, and health: a literature review. 2011 Toward evidence-based, client-centred nutrition education guidelines: dietitian and consumer survey results. 2011 'Going green' in food services: Can health care adopt environmentally friendly practices? 2014 Processed and ultra-processed food products: consumption trends in Canada from 1938 to 2011.
professional practice (e.g. dietetic education, dietary assessment using mobile devices). What did articles look like, 20, 30 and 40 years ago? How will publications look in the next 10 years? I imagine we will continue to look more to technology and social media to support our varied practice settings. The Journal continues to be an important vehicle for thought leadership in our profession, supporting knowledge, information and exchange. I feel privileged to be a part of the continually evolving field of nutrition and dietetic practice. PEN® is celebrating 10 years of technological enhancements! So, we decided to take a look back at the changes to the PEN® website since PEN® started in 2005. 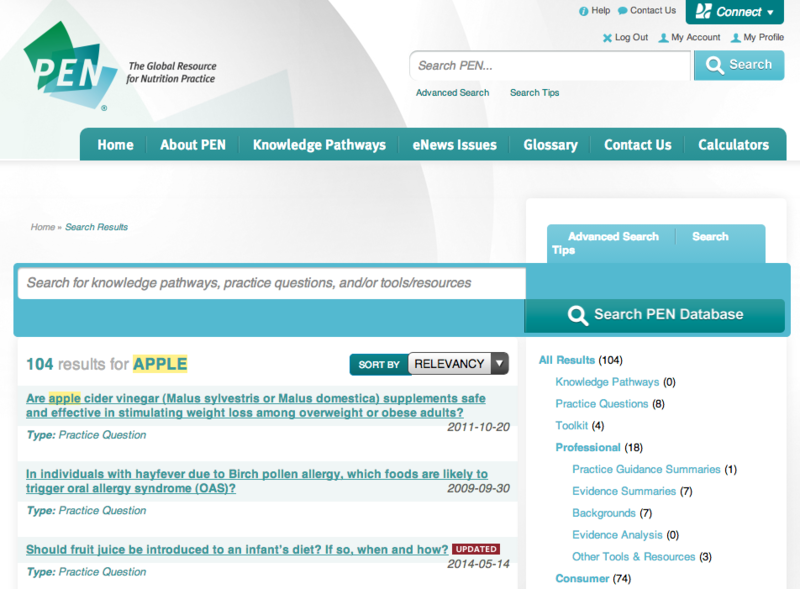 The major changes to the PEN® knowledge database over the past 10 years has been the aesthetics of the website. Although the look of the website has greatly changed, the quality of the evidence-based and peer-reviewed content has continued to be of high caliber. 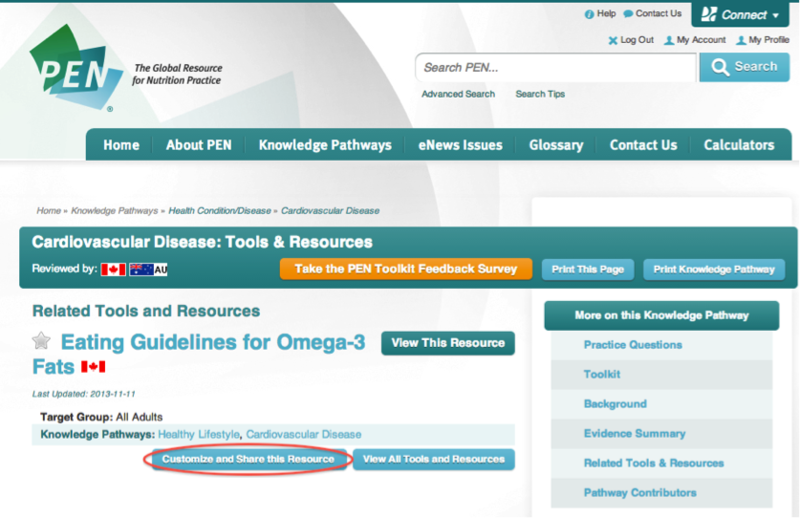 After all, PEN® does stand for Practice-based Evidence in Nutrition! As part of the first PEN® redesign, the logo was given an upgrade from the flat blue and white logo to a more dynamic green and white logo. The PEN® slogan was also changed from “Your Nutrition Knowledge Destination” to “The Global Resource for Nutrition Practice”. This change was to acknowledge the growing number of countries collaborating with Dietitians of Canada to adopt and enhance the PEN® knowledge database as well as the growing reach of the PEN® community around the world. Although the look of the PEN® database has changed, the organization of information as knowledge pathways has remained constant. There have been several technological additions to the database, such as My PEN® Favourites, My PEN® Content Alerts and the customization of handouts, which have provided users with ways to interact with the website. 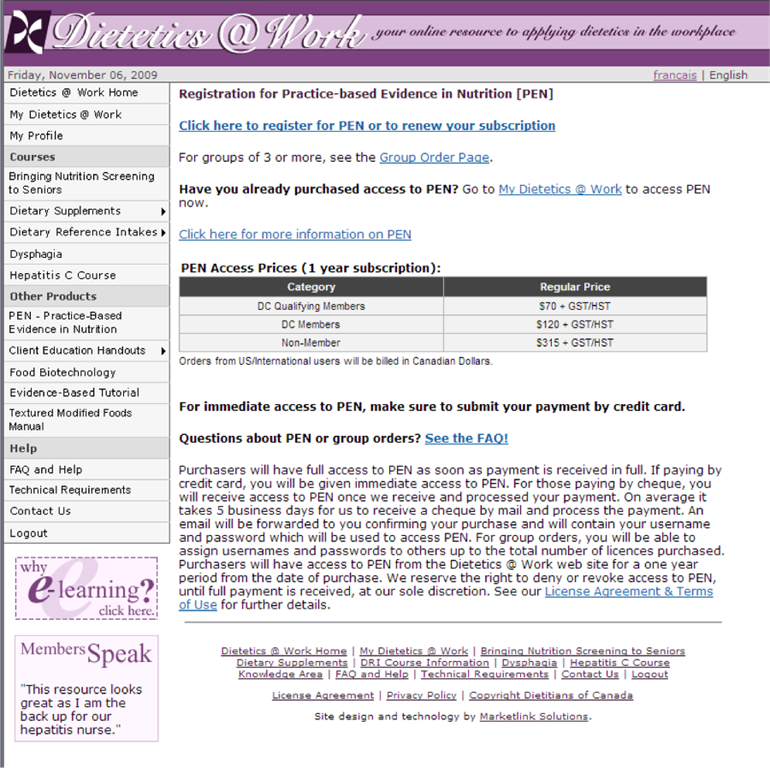 In addition, there are new sections within the PEN® database, such as the toolkits and Trending Topics. The emergence of social media has also had an influence on the PEN® database. Links to Facebook, LinkedIn and Twitter were added to the website to keep our members connected and informed about new content and features in PEN®. The PEN® team is busy redesigning the PEN® website to keep current with best practices in web design and technology. Keep an eye out for the new design, unveiling in 2016! [Here is a sneak peak]. Congratulations to all those who contribute to keeping the PEN® knowledge database current and relevant to dietetic practice around the world. Here’s to another groundbreaking 10 years! What is PEN®? 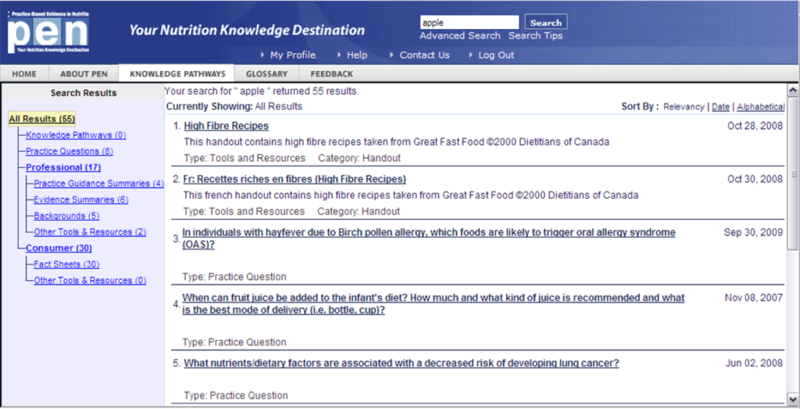 Dietitians have practice-based questions. PEN® has evidence-based answers. 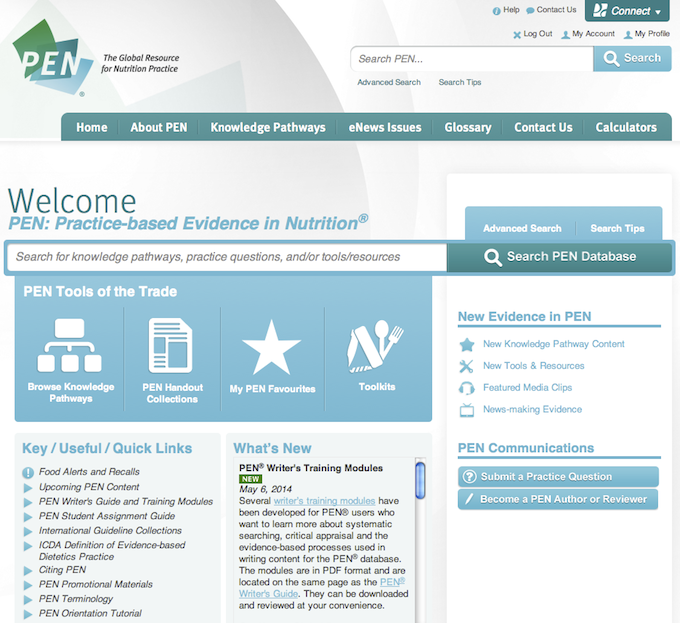 PEN® is a one-stop nutrition knowledge repository to power your nutrition practice. Watch our videos to see who we are and how we help. Why did we choose the name Practice-based Evidence in Nutrition? How has PEN® impacted dietetic practice? What is the power of collaboration in dietetics? A quill pen, made from a feather from a large flight bird, was the essential writing tool before the fountain pen. Even today some calligraphers still use them. 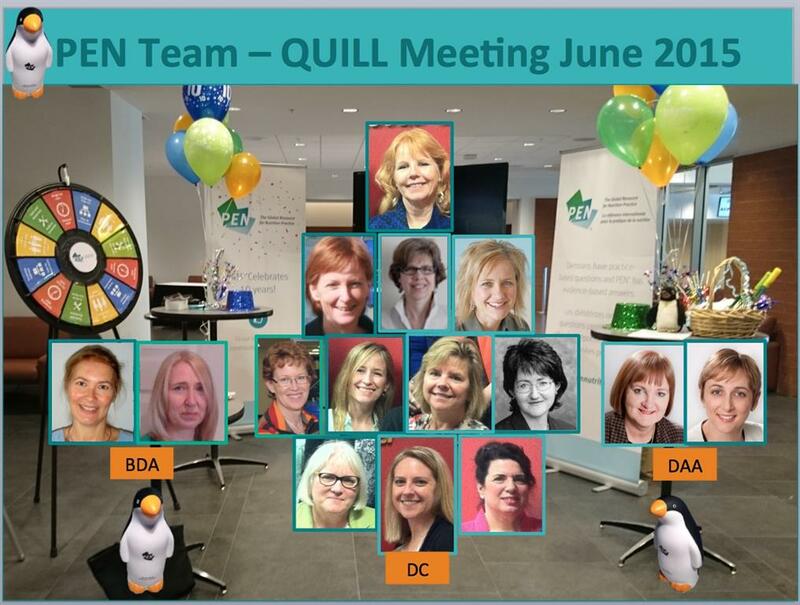 In keeping with the “pen” theme, the international PEN® content working group was named Quill (so named by Claire Hewat, CEO of the Dietitians Association of Australia). The PEN® Quill group is responsible for developing and overseeing the attainment of an annual joint PEN® content plan and the communication strategy (social media and PEN® eNews) for the PEN® system. 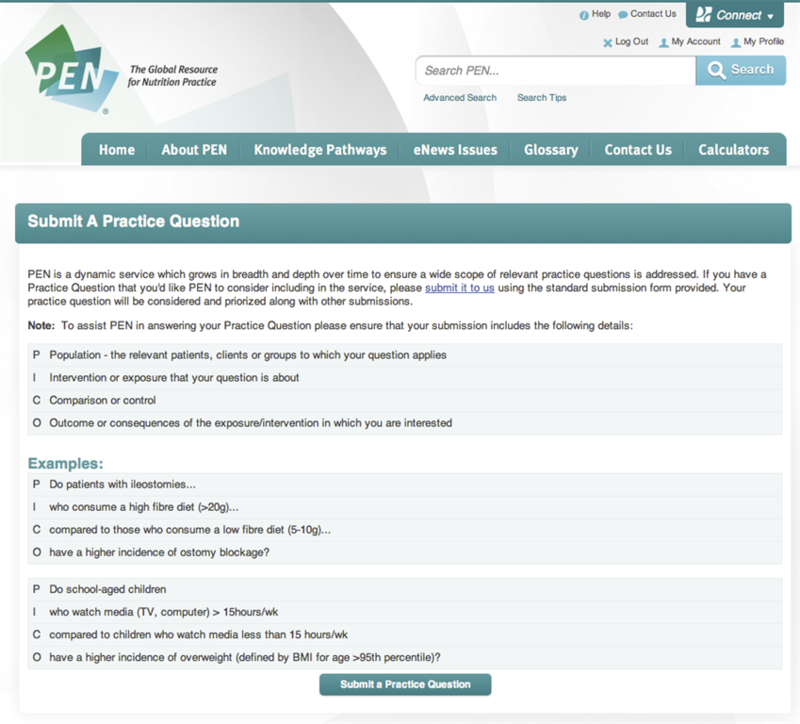 PEN® content includes knowledge pathways, new practice questions, updated practice questions, professional tools, and handouts. Attaining our annual joint PEN® content plan is a big…no HUGE job! 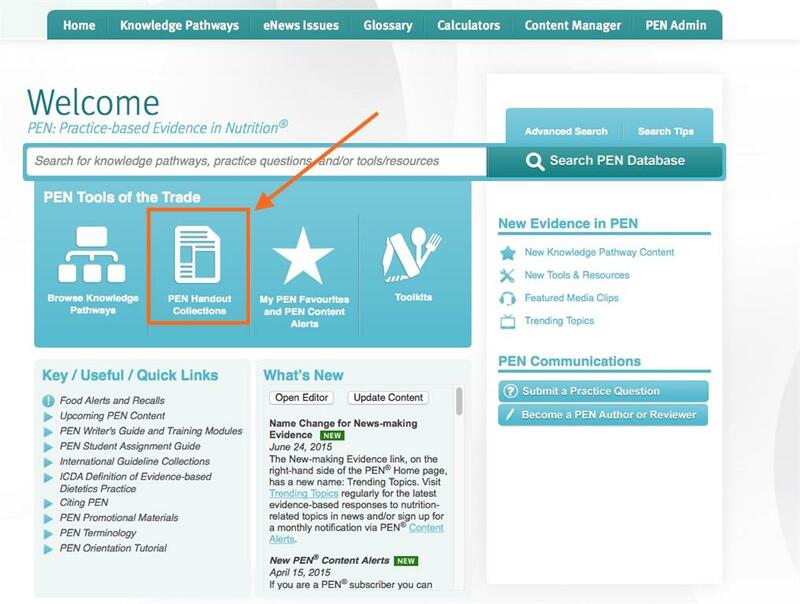 It requires that we establish, consistently implement, monitor, adhere to and review standards and processes for creating and reviewing the evidence-based content for the PEN® knowledge database, as well as a strategy for disseminating this content to you, our PEN® database user. PEN® has 190 knowledge pathways, over 1100 practice questions and answers, over 165 background documents, 69 toolkits, 178 evidence summaries and over 3000 tools and resources. 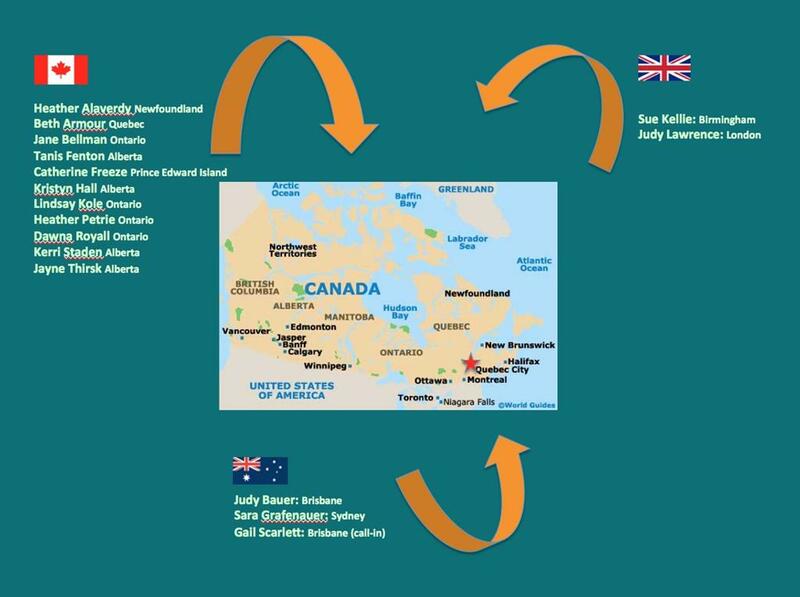 At least one member from each partner country (Canada, United Kingdom and Australia) must be present for us to hold a meeting and we use a consensus approach to our decision-making. We host our meetings on a bimonthly schedule via teleconference. Did you know that if it is 5 am in western Canada, it is noon in Birmingham UK and 11 pm in Canberra Australia? We’ve been meeting by teleconference for a couple of years now but the recent celebration of the 10th anniversary of PEN® at the Dietitians of Canada conference provided the opportunity for the first ever in-person Quill meeting in beautiful Quebec City, Quebec, Canada! Our meeting started at 7:30 am and we got right down to work! While the current PEN® grading system is robust, adopting the internationally recognized GRADE system would further enhance the PEN® database’s credibility. We discussed the implications of implementing the GRADE system and the training and support needs of PEN® authors and reviewers. We made the decision to implement GRADE and our internal training will begin immediately. Stay tuned for updates on what this will mean for the PEN® database and for opportunities for dietitians to enhance their own critical appraisal skills through PEN®-GRADE training opportunities. The layout and design of the current PEN® website is almost 5 years old and with more people using tablets and smartphones, we needed to make PEN® responsive to these types of devices. We reviewed mockups of the new PEN® website and reflected on the feedback from users regarding the development of a PEN® phone app. Look for some exciting changes to the PEN® website in 2016! Click here for a sneak peak! Other discussions focused on strategies to put timely and relevant evidence into the hands of users through our Trending Topics (formerly News-making Evidence) service. We also had the opportunity to test the online workflow system that will assist us with tracking the content being worked on by the many PEN® authors and reviewers from around the world. Better tracking means more content can be worked on at once which means more timely updates for our PEN® users! We discussed feedback received from our authors and reviewers that will lead to important improvements in our content development and editorial processes. We wrapped up our day with a lively discussion about PEN® communications and marketing including our social media strategy and plans to engage with other dietetic associations around the world. While technology allows us to work together virtually from distant parts of the world, our first ever in-person Quill meeting strengthened the PEN global partnership through inspiration, dialogue and teamwork. Dietitians are expressing a growing interest in using mobile applications (apps) in their practices (1) with research to support the role of apps in improving some health behaviours (2,3). With the dietetic community expressing specific interest in access to PEN® content through an app (2), a cross-sectional, 12 question online survey was created with our partners to gather information about how PEN® users might use an app and what specific features would be desired. 84% of respondents would use a PEN® app and there was overwhelming support for the development of an app for professionals (98% of respondents). 70% wanted the app to allow the professional to do nutrition assessments such as nutrient intakes; energy requirements; and BMIs. Basically, professionals want access to most, if not all, of the features in PEN®! The PEN® technology team has a lot on their plate at the moment, including a total redesign of the PEN® website (as noted in the article Technological Advances in PEN® over the last 10 years). When the website work is nearing completion, they will turn their attention to using the survey feedback to inform the PEN® app development plan. This will include refining the scope of the app and project timelines; strategies to address user access, resources (financial and human), evaluation processes, and marketing (to users and possibly other health professionals); and following-up with the 164 users who identified themselves in the survey as wanting to help with piloting the app and contributing in an advisory capacity. Thanks to those of you who completed our app survey and provided us with helpful information. PEN® is reviewing its current handout template with a view to making changes in early 2016. 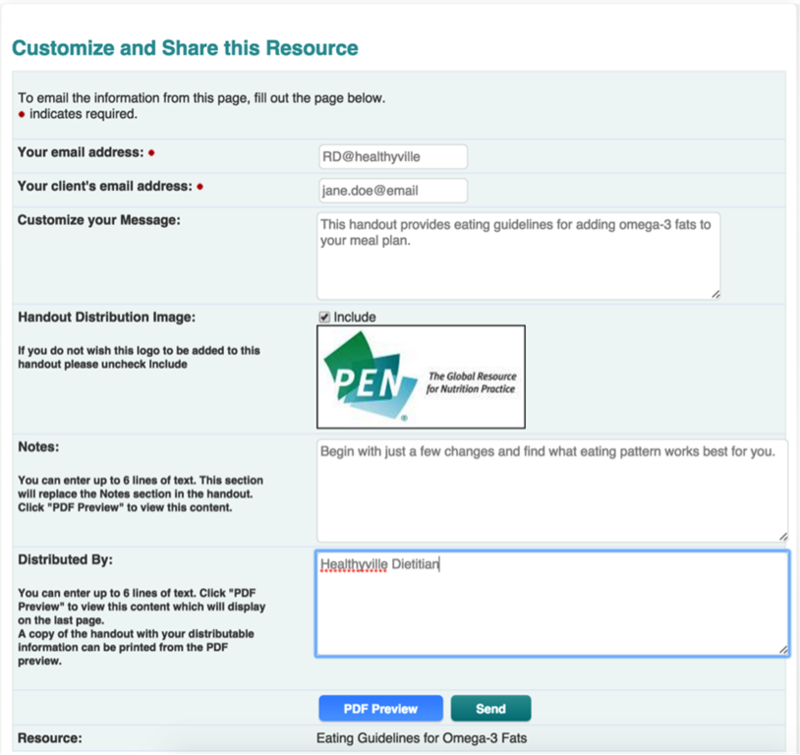 In anticipation of this, visitors to the PEN® booth at the Dietitians of Canada Conference in June 2015 were asked for their opinions on the features of the current and future client handouts. The focus was on the structure and format of handouts, but comments on content were also received and recorded. Majority (77%) of those surveyed were happy with the current layout and recommended few changes. A couple of participants suggested that the font could be larger (although the current font is size 14 and if much larger would extend into more pages). Most dietitians liked the idea of being given the choice of being able to retain or delete the Additional Resources, Notes and Distribution By box sections within a handout. The decision as to whether or not to embed URLs or to print out a full URL in the handout body and/or Additional Resources section was less clear, with 56% voting for embedded URLs, 36% wanting the full URL and 8% being neutral. Ninety per cent would use a shorter version of a handout (in addition to the current handout) if one were available. Being able to visually highlight key information for clients was deemed as helpful. (Note: a new feature enabling dietitians to customize the Notes section to add personal recommendations or set goals for clients is now available). Lastly, other comments received on general content included removing references to follow Canada’s Food Guide in handouts when more specific information can be provided, more flexible search function and keywords that include common misspellings, a symptom-based search function, additional topics to develop, adding more pictures and images, change/update graphics and use modern Chinese versus traditional Chinese for translations. Our global PEN® partnership has benefited from volunteer efforts around the world. Please take a moment to read and acknowledge your colleagues who have served as authors, or peer reviewers for PEN® content since August 2014, as well as the International Working Groups. If you would like to be a PEN® author or reviewers, please click here to send us your contact information. What do King Nebuchadnezzar, Johnny Depp and Archie Cochrane have in common? Where did we start to conceptualize the PEN® service, what were the drivers and important contributors and milestones in our PEN® journey? Where did 10 years go? It was my pleasure to share the podium with Judy Bauer and Sue Kellie representing Dietitians Association of Australia and the British Dietetic Association as we shared our reflections on where PEN® has been over the last 10 years at the recent Dietitians of Canada conference in Quebec City. Take a moment to listen to our fun video presentation about our first 10 years and the PEN® partnership’s growing reach and impact in dietetic communities around the world. We’ve never seen a time when evidence has been more abundant. We’re deluged with guidance and not all of it is good quality and certainly much of it is inconsistent. We’ve also never seen so many crazy headlines promising so many ridiculous things about food and nutrition. Diverse information channels provide platforms for so many unqualified and celebrity experts with so many contradictory recommendations. This creates so much noise and confusion that the validity of all nutrition research is being questioned. Every day, all over the world, dietitians are being asked to comment on provocative media headlines, bust another crazy nutrition myth, or rule on contradictory recommendations from different clinical practice guidelines. To add to the challenge, many consumers of our advice have developed a taste for information via sound bytes or in 140 characters – certainly not the best vehicle for conveying the complexity or nuances of nutrition science. As dietitians, we appreciate that knowledge builds, often slowly, and seldom in a straight line. The study of nutrition/diet and health outcomes is complex. The placebo effect is alive and well and it fools people every day into thinking that the diet, nutrient or natural health product they just tried made them feel better. And social media allows them to share this newfound wisdom with thousands of friends in an instant. And yet, as health professionals, we are expected to practice critical thinking and base our practice on evidence but to do so with a sense of immediacy that I’ll confess makes me feel somewhat desperate at times. In addition to spending my days pouring through evidence, I also monitor a lot of professional blogs and social media groups. 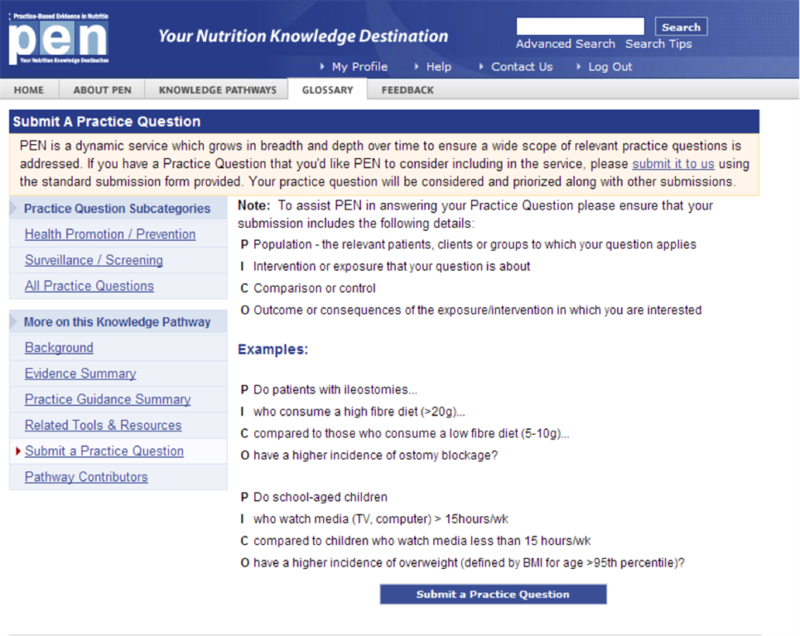 I am in awe of the diverse and complicated practice questions dietitians receive everyday. It’s also clear to me that there is not good evidence to answer some of the issues or questions dietitians face. Patients may present with a vague complaint or may have multiple diagnoses that complicate what evidence or guideline a dietitian might turn to. But despite these challenges, we still feel compelled to provide some helpful counsel to our clients - in these circumstances we draw from our foundational knowledge and available evidence, combined with our clinical judgment. In their book Practice-based Evidence for Health Care: Clinical Mindlines (1), Gabbay and le May confirm how valuable trusted colleagues are as sources for helpful information. They observed first hand how personal networks of experts were critical to assisting practitioners with evaluating new information, especially when the new information challenges what they thought to be true. I worry that in our desperation for a quick answer, we sometimes accept any answer rather than the best answer; one based on thoughtful assessment and critical thinking. I’ve done it myself, grabbed at the nugget of information that perhaps confirms my belief without pausing to look for opposing evidence. Or I consulted only with colleagues whom I knew generally shared my views. Gabbay and le May urge practitioners to develop their skills or techniques to encourage rigourous, but respectful questioning and appraisal of the views put forward when we seek counsel from our personal networks. We need strategies to avoid groupthink or confirmation bias. We must restrain our tendencies to settle for any answer and be systematic in our search for the best answers. But we must be mindful of not being paralyzed into inaction while waiting for evidence that may never emerge. Does the paper reflect someone’s opinion or is it a systematic review of all the best information on the topic? Does the information describe an association or suggest a hypothetical mode of action or was the research designed to measure a cause and effect relationship? Were the studies large and what population did they look at? Were the results important (likely to have a significant effect on symptoms or health)? How does this fit with what we already know? Are there any risks associated with the intervention being proposed? And importantly, is this evidence ready for application to practice or do we need to wait to see if other research groups replicate it? 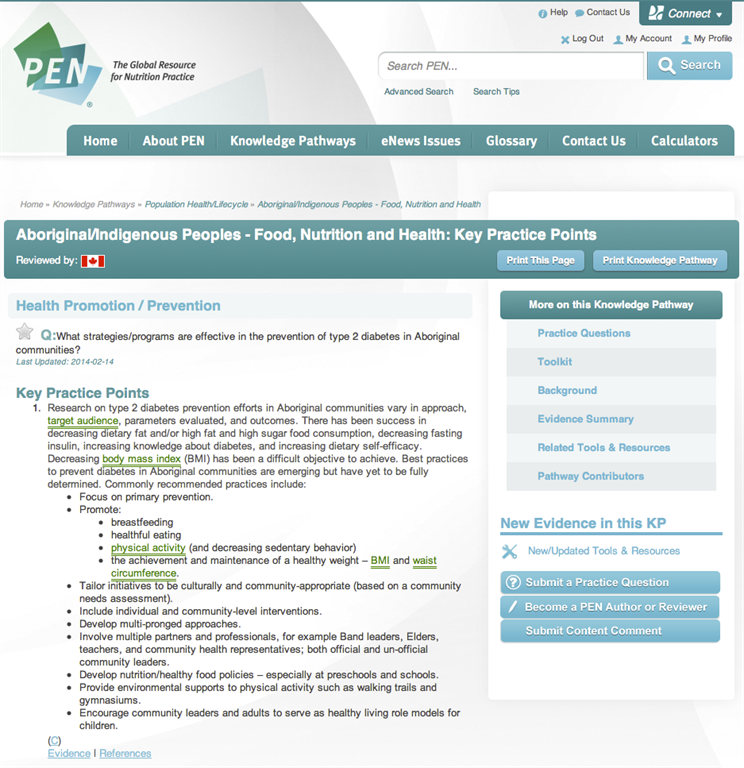 One of the principle objectives of the PEN® Global partnership is to build capacity for dietitians to become evidence connoisseurs; helping them appreciate just what makes for best evidence, how to conduct critical appraisal of research and how to communicate their assessments in ways that are meaningful to their clients and stakeholders. In the coming year, the PEN® team will transition to incorporating the GRADE system into its critical appraisal approach. Many authoritative organizations around the world are moving to this grading system. We believe its adoption by the PEN® system will enhance the rigour and transparency of our guidance. The PEN® team will work closely with the Department of Clinical Epidemiology and Biostatistics at McMaster University to develop not only a GRADE implementation plan for the PEN® system but also a training program for dietitians to learn how to use and interpret this internationally recognized critical appraisal system. In 2016 we will also launch a new responsive PEN® website. Among its many features will be a new approach to crafting our key practice points so they provide more detail on how to translate the evidence into practice. And, we’ll further explore the development of a PEN® app. As we summed up in the PEN@10 celebration, staying abreast of the latest and best practices in evidence-based practice, knowledge transfer and information technology remain primary goals for the PEN® global partnership so we can ensure that future dietitians have cutting edge tools to support their practices. We plan to engage more global partners; inviting more national dietetic associations, universities and dietitians from around the world to join the PEN® community. In this way, we ensure the sustainability of the service while providing a platform for dietitians to collaborate with colleagues around the world. We want to encourage each of you to use PEN® to enhance your critical thinking skills, raise your profile and to create opportunities for yourself as leaders in evidence-based nutrition practice. Use it to develop blogs and media sound bytes, proposals, briefing notes, lectures and patient care. Use it to respond to misinformation. In short use it to make your job easier. Share your successes and challenges with the growing PEN Community. Come and be active participants in the growing PEN Community! We are stronger together. Hurd PDH. Scientific Literacy: New Minds for a Changing. World. Science Education 1998, 82:407-416. 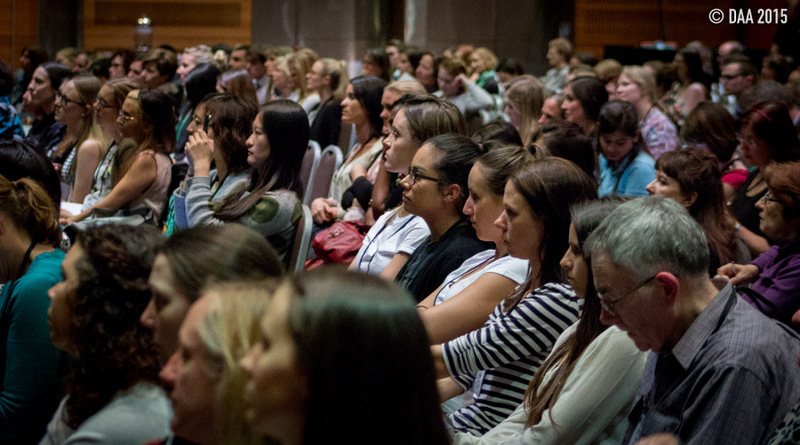 The Dietitians Association of Australia (DAA) 33rd National Conference will be held 19-21 May 2016 in Melbourne, Australia, with an expected attendance of more than 1000 nutrition and dietetic professionals, both from Australia and overseas. The Conference’s Social and Scientific Program Committee invites the submission of abstracts for consideration as oral presentation or a hard copy poster. Innovative and creative proposals are also sought for workshops and seminars. The conference program has been designed to ensure delegates are 'On Track for the Future', with three plenary themes (food, leadership and translation) showcasing eight outstanding keynote speakers. We hope to see you at our conference! 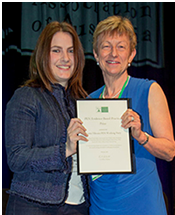 The Dietitians Association of Australia (DAA) awarded its first PEN® Evidence-Based Practice Prize in 2015. This prize is awarded to Accredited Practising Dietitians (APDs) who demonstrate strength and commitment to evidence-based practice in a practice setting, particularly in challenging circumstances. The 2015 prize was highly competitive, exemplifying the strong commitment to evidence-based practice in Australia. The 2015 winner was The Cystic Fibrosis (CF) Working Party, led by Nicole Saxby Advanced APD (AdvAPD) who are working to develop a CF knowledge pathway in PEN®, consisting of 75 practice questions! This group consists of 35 dietitians, three methodological experts and 20 interdisciplinary colleagues. All members of this group are hospital-based dietitians working in specialist cystic fibrosis (CF) centres across Australia and New Zealand. 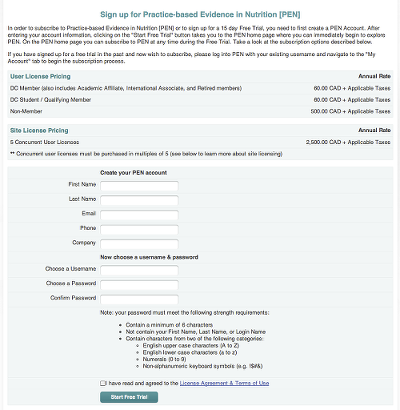 The PEN® Evidence-Based Practice Prize focused on the work of a sub-group of 12 dietitians who successfully developed and addressed six clinical practice questions on mineral management in CF populations which has been submitted to PEN® and is now in the editing stage. Applications for the 2016 prize are now open to DAA members. DAA looks forward to seeing applications that demonstrate the ongoing commitment of Australian dietitians to evidence-based practice in their setting. Males in Dietetics, What can be learned from the nursing profession? A narrative review of the literature. Click here. Dietitians around the world have similar practice-based questions and face similar challenges in trying to stay on top of emerging evidence and nutrition research. The story of collaboration to create a sustainable and innovative tool that synthesizes the knowledge foundation for the dietetic profession worldwide will be highlighted. Milestones on the road to this collaboration will be shared from the BDA, DAA and DC, along with the diverse ways PEN® is being used and how it has promoted dietitians as leaders in evidence-based nutrition practice around the globe. Mentoring is one of the ways practitioners maintain their vitality and the profession retains standards of excellence. Evidence suggests that all professionals benefit from mentoring relationships throughout their career – both as a mentor and a mentee. Our presenters describe the Consulting Dietitians Network Mentorship Program and illustrate how this model can benefit RDs in all practice settings. Listeners are provided with practical direction to becoming a mentee or a mentor, learning skills to self-evaluate for strengths and areas for improvement in being a mentor or seeking mentorship, and gaining knowledge on how to create a mutually beneficial mentorship relationship. PEN® does not have editorial or other control over the contents of the referenced Web sites. We are not responsible for the opinions expressed by the author(s) of the knowledge transfer events and do not endorse any product or service. How do I find timely information on hot topics in nutrition? Do you have comments, questions or feedback? Connect with us! a collaborative partnership between International Dietetic Associations. Copyright Dietitians of Canada . All Rights Reserved. We made it! Celebrating PEN@10 years! Technological Advances in PEN® over the last 10 years.